Judging by his big Reese’s mug, Federal Communications Commission (FCC) Chairman Ajit Pai seems to like, as do many, chocolate, peanut butter and coffee. But, he seems to hate, as do only a very few, internet freedom. In 2015, the FCC issued an order, which secured that freedom. The order changed the classification of internet service providers (ISPs) from information services to telecommunications services. As a telecommunications service, an ISP must not interfere with the content a person chooses to receive or send. That ISP must follow FCC net neutrality rules to not throttle or block lawful data based on its origin or content. When Donald Trump got elected, a Republican majority on the FCC became inevitable. Shortly after, Pai gave a speech, and recounted how, on the day the FCC issued its order to secure net neutrality, he said that he believed “its days are numbered.” He said, “Today, I am more confident than ever that this prediction will come true.” And, as it has unfolded, Pai himself has become FCC Chairman, and is leading the charge to snuff net neutrality. But, as a commissioner since 2012, Pai must know that net neutrality is very popular. And he would know that millions of internet denizens posted four million comments to urge the commission to secure net neutrality. Not long after, the FCC issued its order to do so. In cutting against that popularity, Pai has been less than forthright, and has used tricks in getting to his goal. Let’s look at some of Pai’s tricks. Costly and restrictive laws of a bygone era – The Communications Act of 1934, as amended. Still in force. Has not been repealed or declared unconstitutional. Cost-benefit analysis – Despite insufficient data and data to the contrary, the Chairman’s Order draws conclusions by only accepting self-serving statements made by large broadband providers. It makes no effort to verify these claims against the statements these very same companies have made in filings before the Securities and Exchange Commission. See para. 301. Government control of the Internet – Limited rules applying to the residential broadband service delivered on a broadband providers’ own network. It does not include other services offered by broadband providers nor does it include services offered by edge providers (e.g.,Google, Facebook, or Netflix). Market-based policies – Policies favoring little to no regulation for powerful broadband providers. Network innovation – The ability of broadband providers to charge more for service to both sides of the two-sided market. See para. 250. For almost 20 years, both Republican and Democratic Chairmen of the FCC have asserted the FCC’s ongoing responsibility and authority to protect consumers and promote competition in the broadband access market. Rather than admit that this draft Order is a radical break from a bipartisan consensus on FCC authority to protect consumers generally and net neutrality specifically, Chairman Pai prefers to surrender this power to broadband providers, enabling them to set their own ‘net neutrality’ standards. One way the people won net neutrality and internet freedom was by sending millions of comments to the FCC in support of it. When Pai issued his rule-making order to kill net neutrality, millions again rose to comment. The crush of comments seemed to bring down the FCC’s web site. But the FCC claimed the outage was due to a distributed denial of service (DDOS) attack. Since then, reporters and senators have asked the FCC for evidence of the DDOS, but the agency has not produced any whatsoever. And in response to a Freedom of Information Act (FOIA) request, the FCC produced only a laundry list of dubious excuses — such as protecting trade secrets — for not giving out the data. A reporter has now sued the FCC for violating the FOIA. At any rate, 22 million comments were filed. Of those in favor of Pai’s net neutrality repeal, a great many were bot-produced and fraudulent. The fraudulent comments had signatures of fake or dead persons, or real persons who did not sign. While Pai may not have helped produce the comment fraud, neither has he helped get to the bottom of it. New York Attorney General Eric Schneiderman has been investigating the massive comment fraud, but the FCC has ignored his requests for information. A study funded by a telecom lobbying group found that 60% of the comments were against repealing net neutrality. But the number of unique comments — those that are not form messages — ran 99% against repealing net neutrality. Before my fellow FCC members vote to dismantle net neutrality, they need to get out from behind their desks and computers and speak to the public directly. The FCC needs to hold hearings around the country to get a better sense of how the public feels about the proposal. I think the FCC needs to work for the public, and therefore that this proposal needs to be slowed down and eventually stopped. In the time before the agency votes, anyone who agrees should do something old-fashioned: Make a ruckus. Reach out to the rest of the FCC now. Tell them they can’t take away internet openness without a fight. Commissioner Mike O’Rielly: This is the land of the free. I urge you to vote NO on killing net neutrality and destroying internet freedom. Commissioner Brendan Carr: This is the land of the free. I urge you to vote NO on killing net neutrality and destroying internet freedom. Chairman Ajit Pai: Please suspend the vote on the order to kill net neutrality, and hold public hearings across the country. Net neutrality = internet freedom. Commissioner Mignon Clyburn: Thank you for standing up to keep net neutrality and internet freedom. Commissioner Jessica Rosenworcel: Thank you for standing up to keep net neutrality and internet freedom. 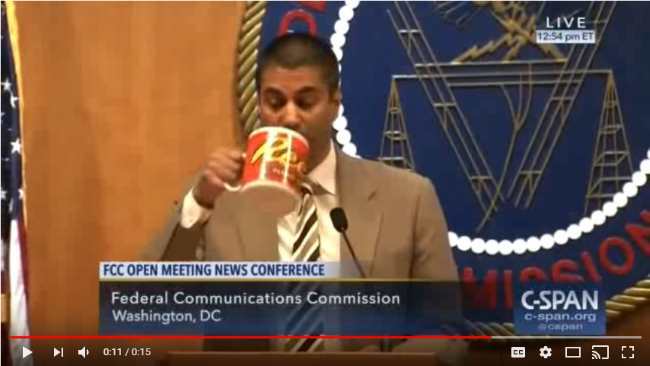 big Reese’s mug “Ajit Pai’s mug” from C-SPAN via Sentry at YouTube.